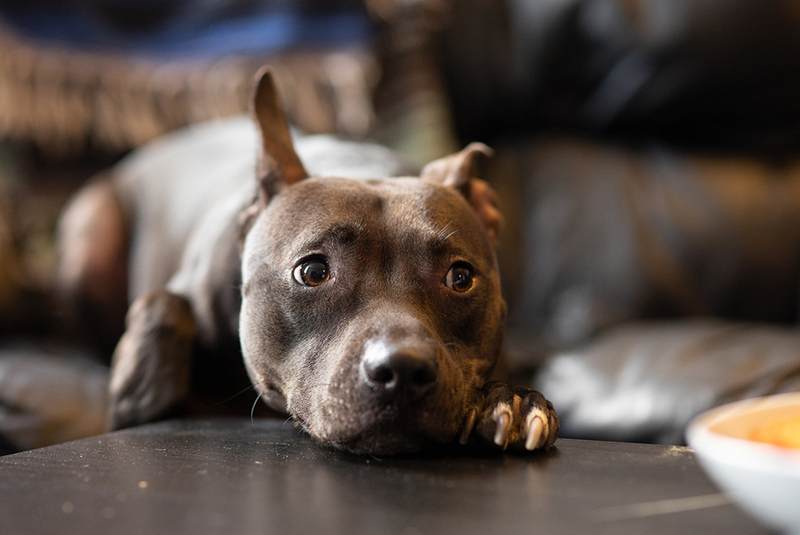 It was described as a “dreary, rainy” day in the Bronx when the New York City Police Department (NYPD), assisted by the ASPCA, executed a search warrant on a local property where there had been reports of suspected dogfighting. 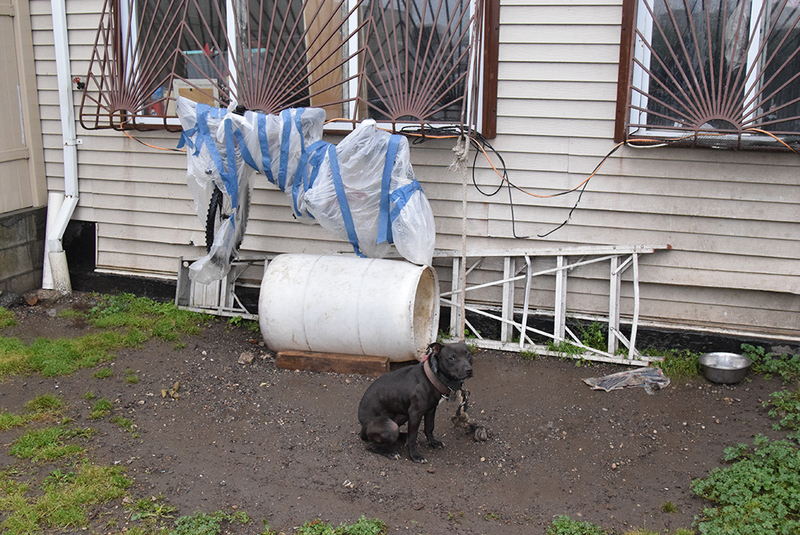 On that rainy day in May 2017, Katherine Good, Foster and Placement Manager for ASPCA Humane Law Enforcement (HLE), waited with the rest of her team as they prepared to enter the home and remove any suffering animals. Though conditions weren’t ideal, the atmosphere that day proved to be quite fitting for the scene that would soon unfold. 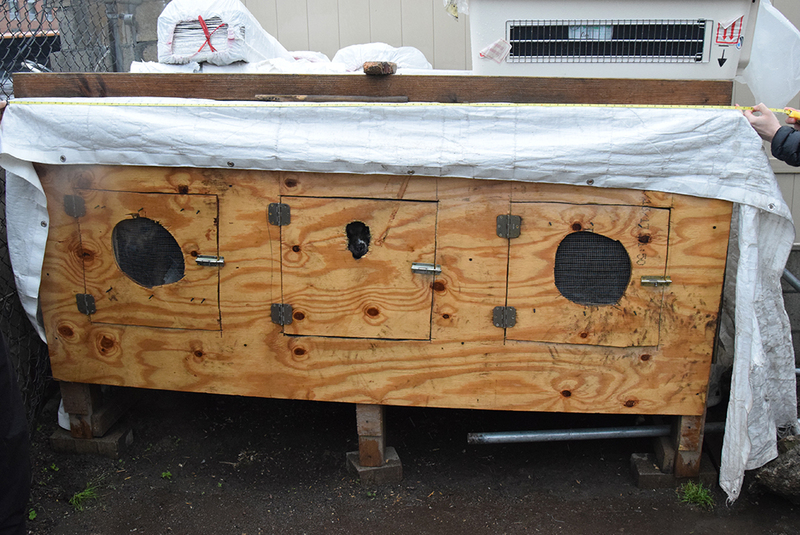 Inside the home, Katherine discovered a few dogs being housed in separate rooms, locked inside dirty crates. But it was what was discovered outside that truly stuck out in Katherine’s mind. 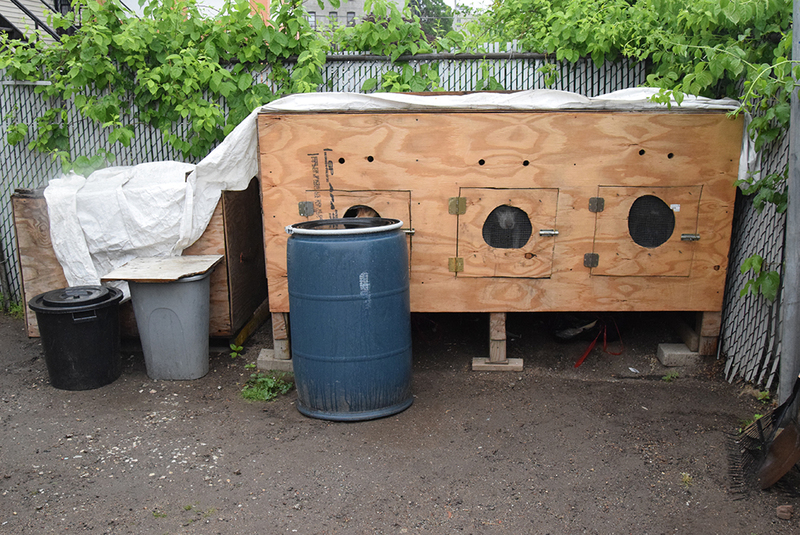 As she and her team moved into the rundown backyard space, they noticed something rather odd. The boxes were small, and they were all latched shut. 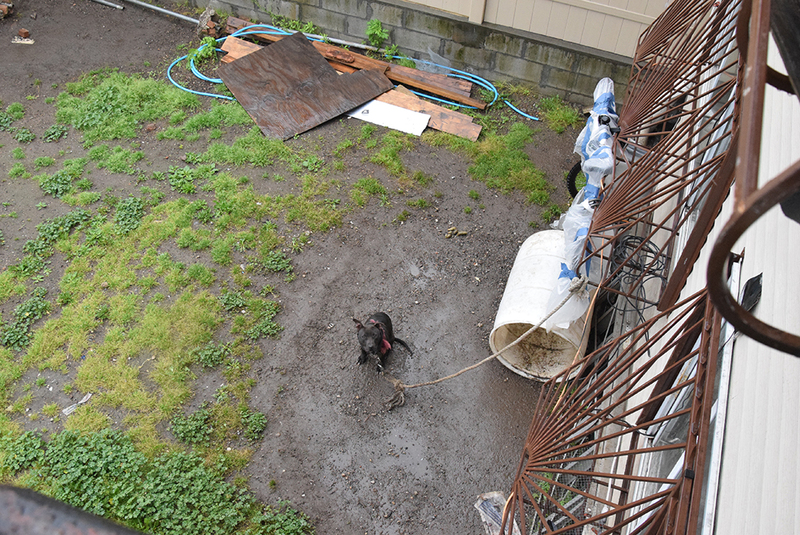 As the team began to open the boxes, it was also discovered that many of the dogs were held down by chains in the enclosures. It was those boxes, and that one dog outside in the rain, that stood out most to Katherine that day. Removing the dogs one at a time, Katherine noted that the dog who was outside alone was excited to see them, and tells us that the dog, now known as Ginny, was “tap dancing” and approaching the responders for attention despite her surroundings and the heavy chain and padlock that was around her collar. 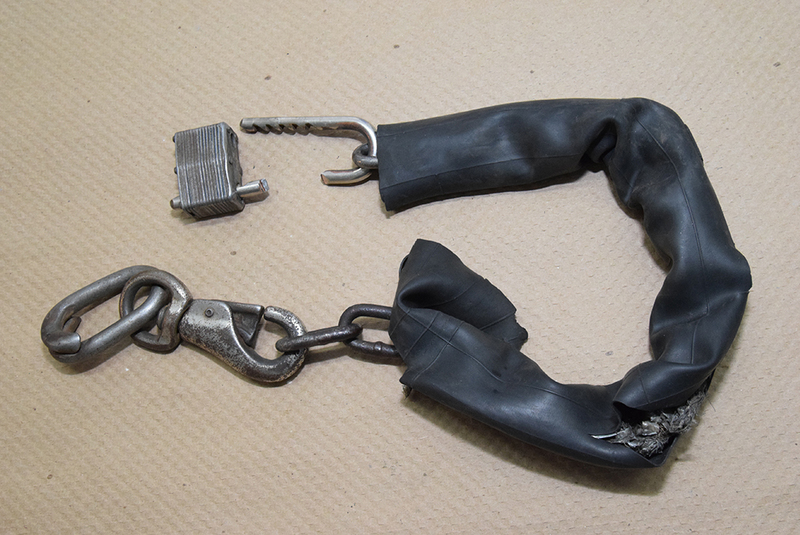 At intake, Ginny had a padlocked chain around her neck. With Ginny’s chain broken, she could now begin healing. 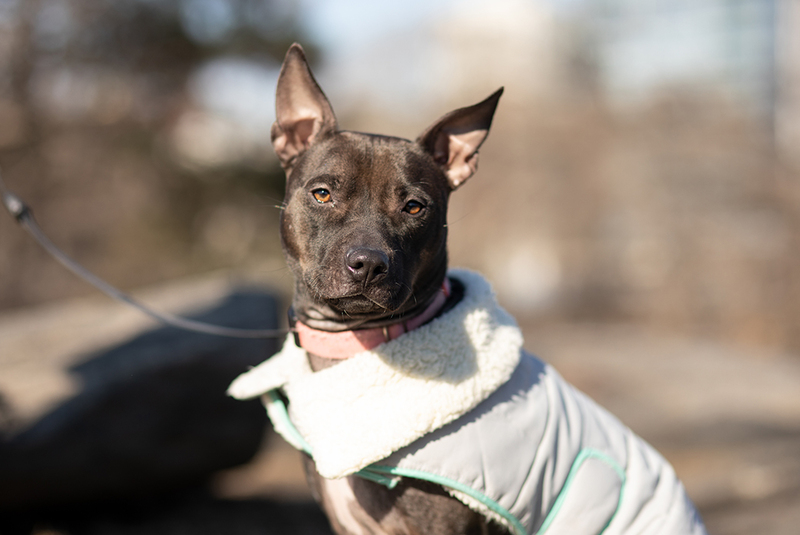 Following their rescue from that deplorable situation, the 11 dogs, including Ginny, were all taken to the ASPCA Animal Recovery Center (ARC), where they were given individual treatment and time to heal. 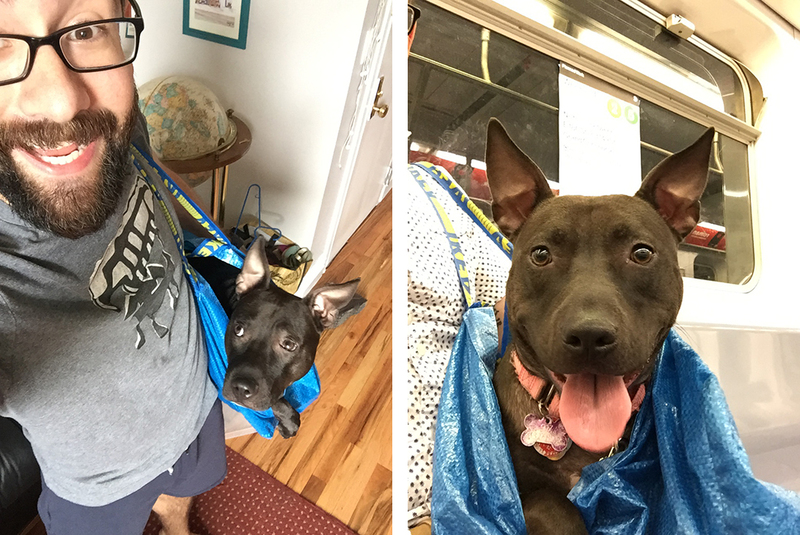 After a few weeks, Ginny was able to move to the ASPCA Adoption Center, where she was made available for adoption. Ginny right after her rescue. 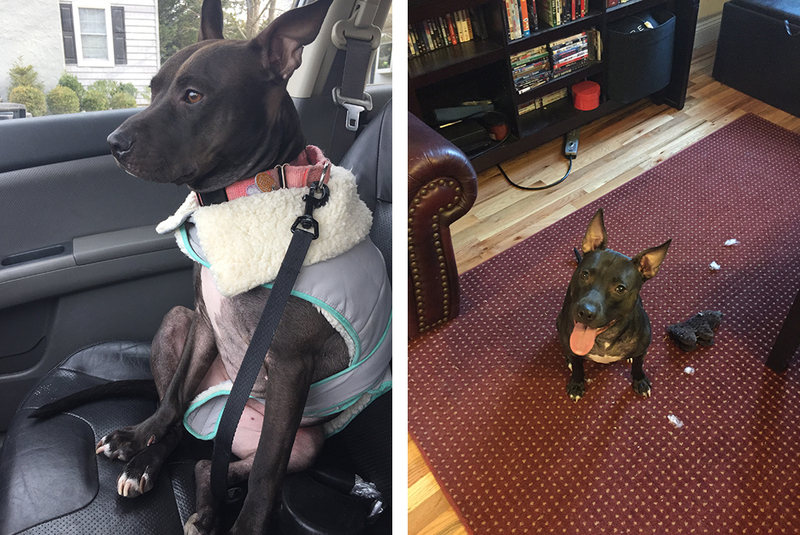 But despite being ready to move on to a loving home, Ginny was still incredibly fearful, and since her experiences in a domestic setting were limited, new things were extremely overwhelming for her. 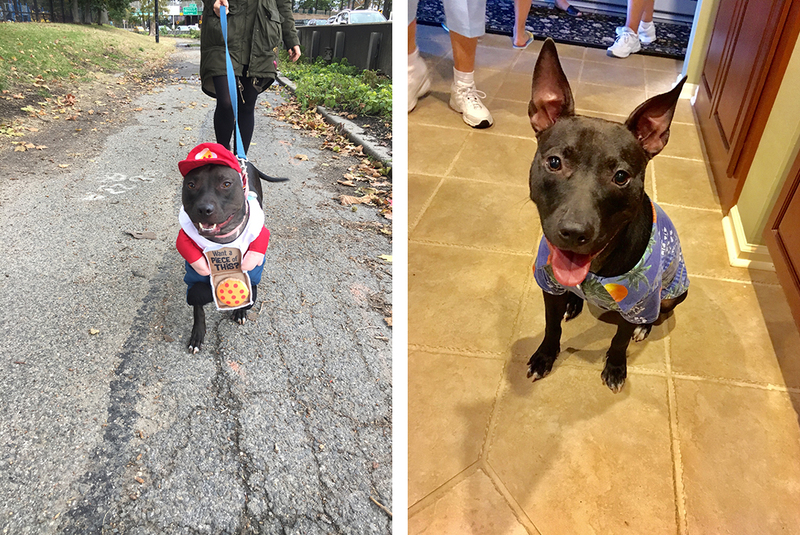 It was clear that to fully move on from her past, Ginny would not only need a lot of support, but she would also need pet parents who truly understood her. 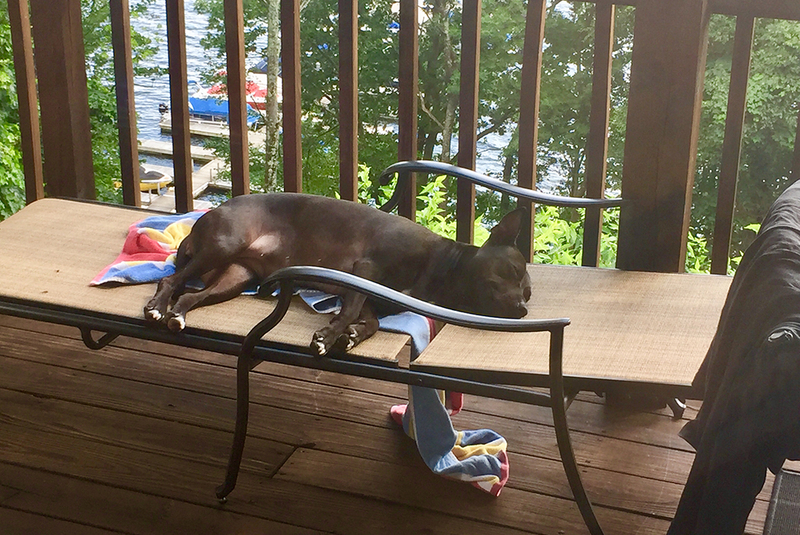 Luckily for Ginny, those adopters weren’t far off. 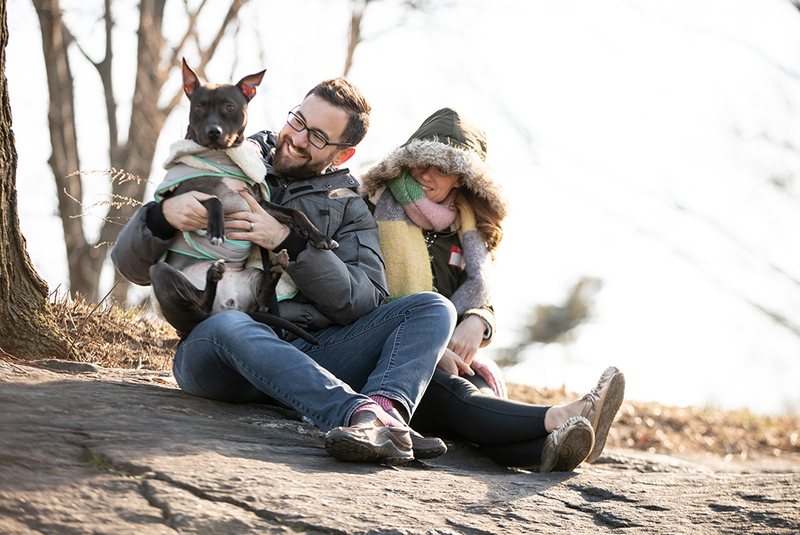 By June 2017, Claire S. and Nick V. had been discussing adding a dog to their small family for some time. 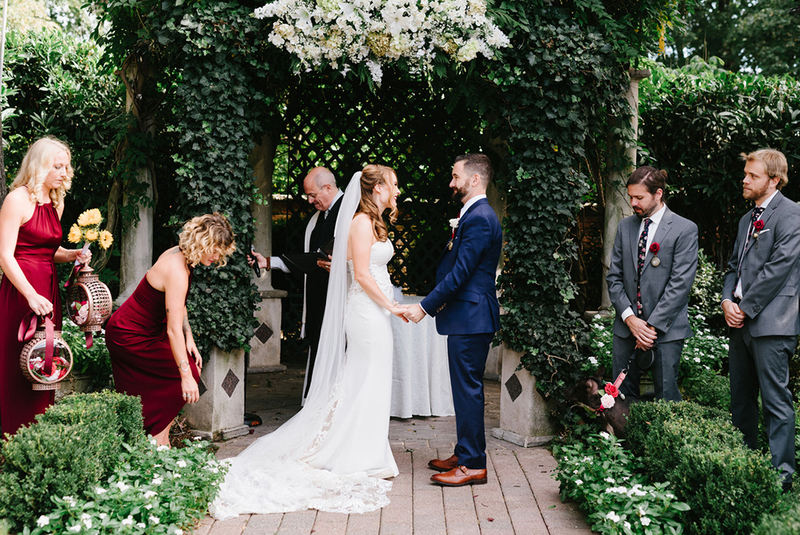 Though Nick had grown up with a dog, Claire was new to the experience, and the couple went into the process without many preconceived notions of what they were looking for. 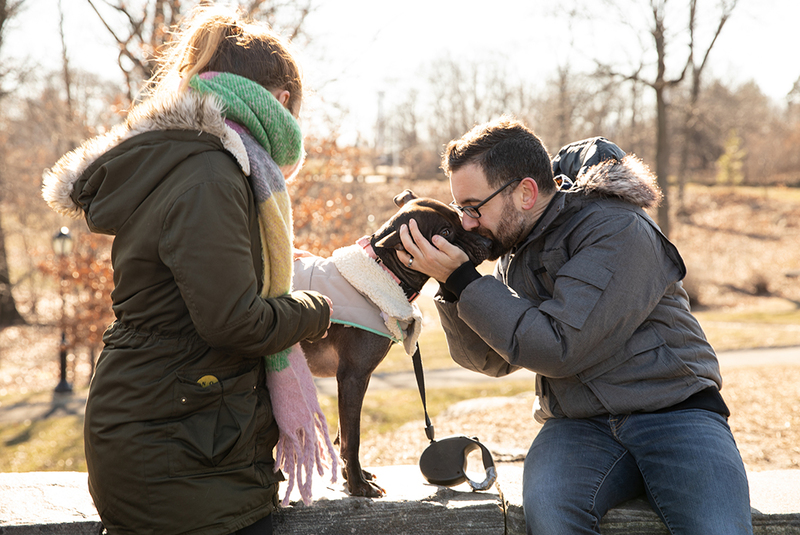 That day, the couple arrived at the Adoption Center with the famous last words of “we’re just going to look.” As they toured the facility and viewed our available dogs, they stopped at Ginny’s enclosure. While the other dogs in the Adoption Center that day were excited, jumping and barking to say hello, Ginny stayed seated quietly in her enclosure. A few hours later, Ginny was in the car with Nick and Claire, heading not only to her new home, but to a new future, away from the traumas of her past. 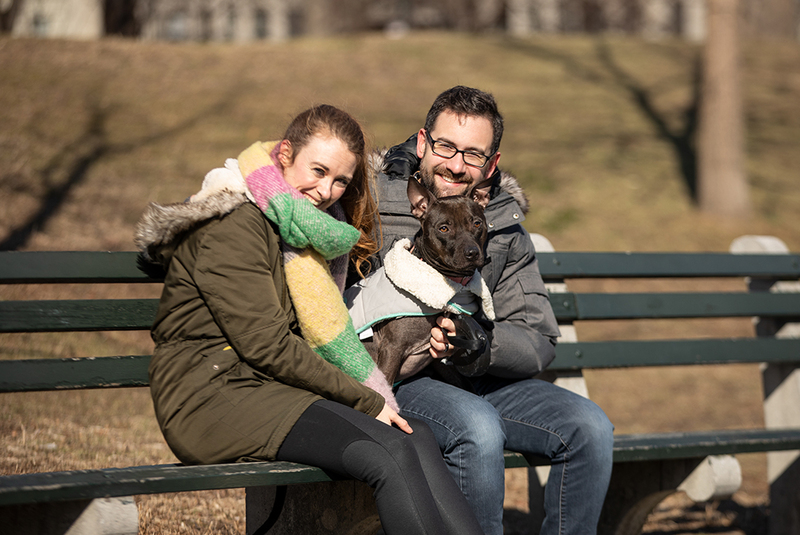 Before taking her home, Claire and Nick were told that Ginny’s adjustment could be tough and that she suffered from anxiety and was fearful of just about everything. But that didn’t deter Nick or Claire one bit. In fact, it made their feelings that much stronger. After bringing Ginny home, the couple began to understand just how severe Ginny’s fears were and how limiting her previous life had been. 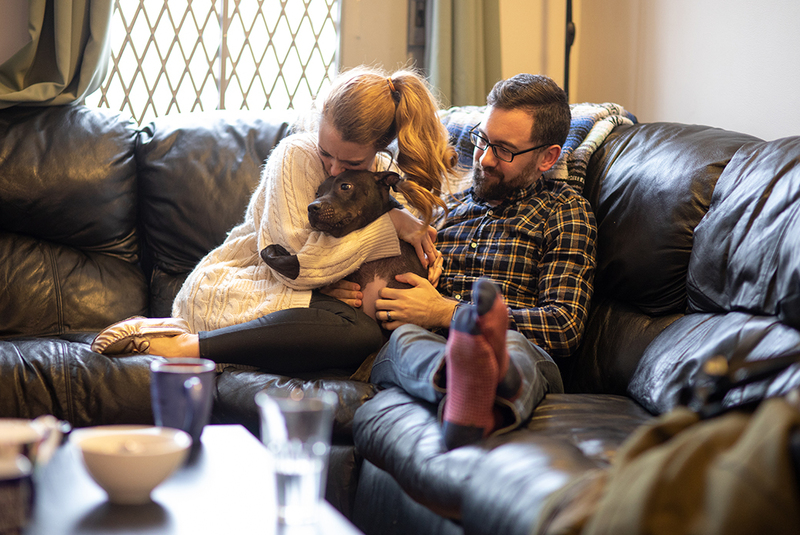 In their fifth floor walk-up apartment, Nick and Claire learned that even seemingly simple things were new and scary to the sweet dog. Nick tells us that on those first few nights, he didn’t get much sleep. “I was hyper-aware of the surroundings, making sure she felt comfortable and safe,” he says. But the couple’s immense patience and compassion for Ginny began to pay off. Little by little, they began to see her coming out of her shell, and once Claire got Ginny a “thunder jacket,” Ginny’s true personality really began to shine, becoming what Claire calls “a ball of joy.” It was at that point that Ginny knew she was finally home. Nick and Claire take Ginny almost everywhere they go now; she’s been to Boston to watch Claire run in the Boston Marathon, she spends weekends at their lake house in the Poconos, she rides the NYC subway and she even spent some time visiting Nick’s grandmother while she was in an assisted living facility (Claire tells us that the other residents there also adored her company). 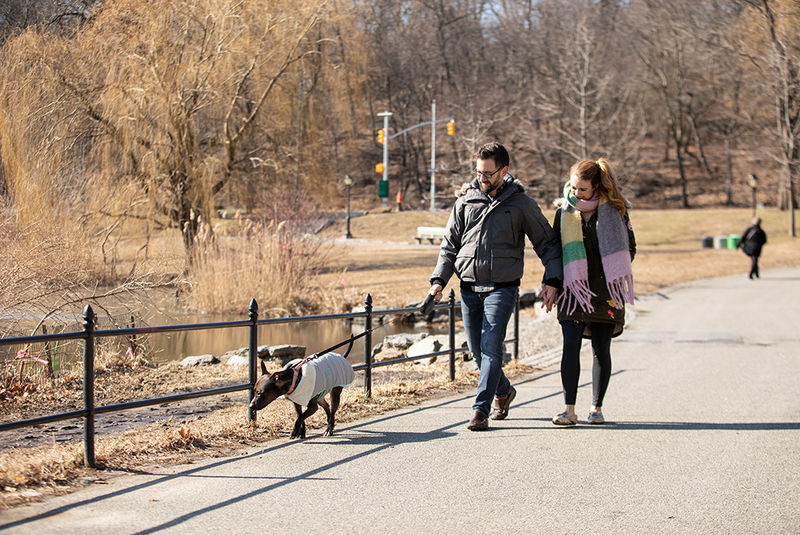 With her confidence in full bloom, Ginny is always up for an adventure with mom and dad by her side. 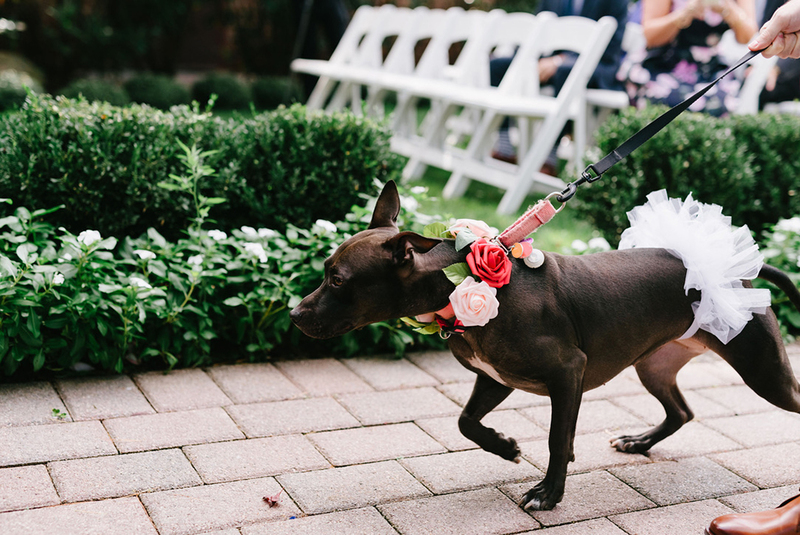 The couple got married in October 2018, and it was no question as to who would be their flower girl—Ginny led the way down the aisle in a collar stitched with flowers and a tutu fit for a princess. Photo courtesy of Longbrook Photography. 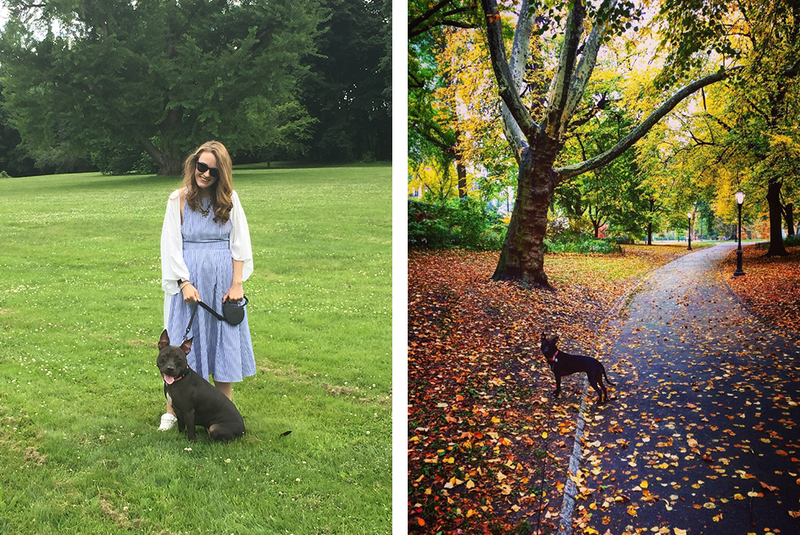 Now, seeing Ginny sprint up and down the stairs, seeing her running in the park and showering strangers with affection, you’d never suspect that her beginnings were marred with tragedy. 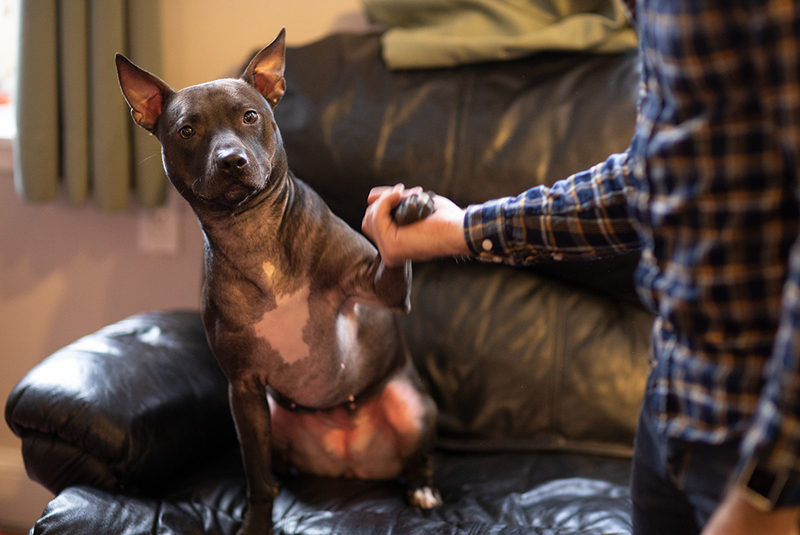 Ginny isn’t what her pet parents envisioned when they thought of a dogfighting victim, and she’s probably not what many of us do either. 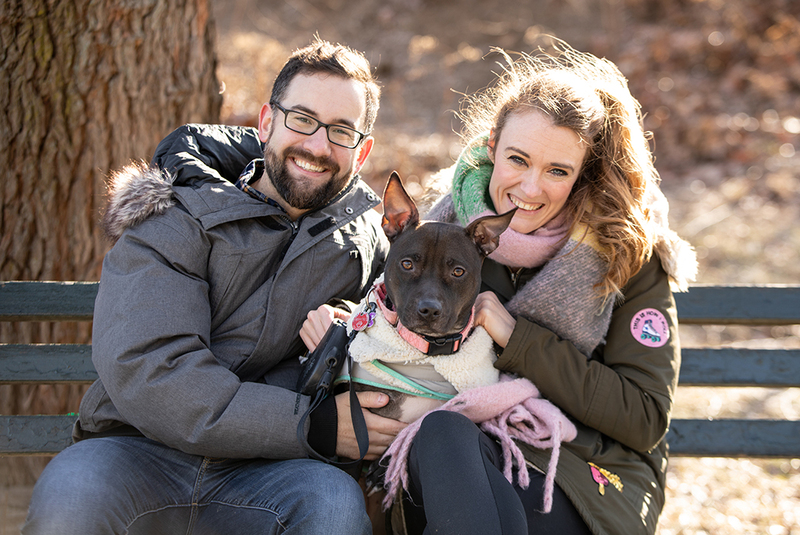 Though Ginny’s story has an immensely happy ending, it doesn’t stop in her home with Claire and Nick. 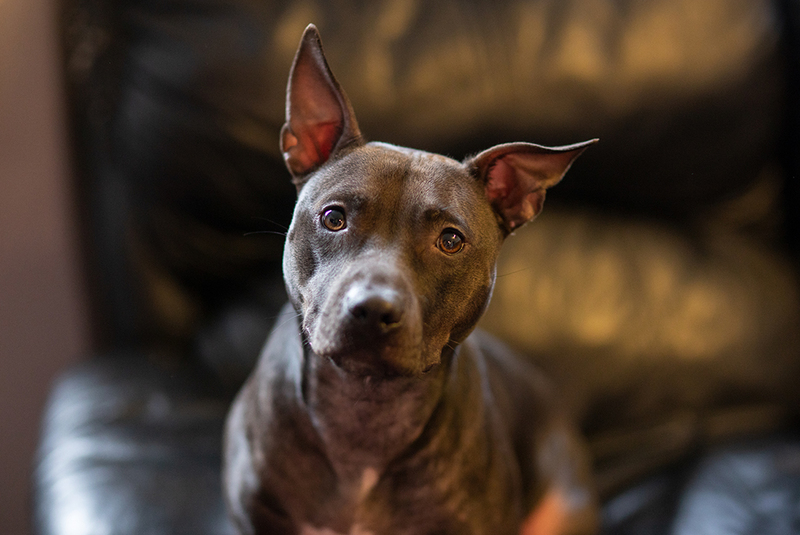 In August 2018, Ginny’s case went to trial and her abuser was charged with conspiracy to possess, train and buy dogs for participation in an animal fighting venture and animal fighting. 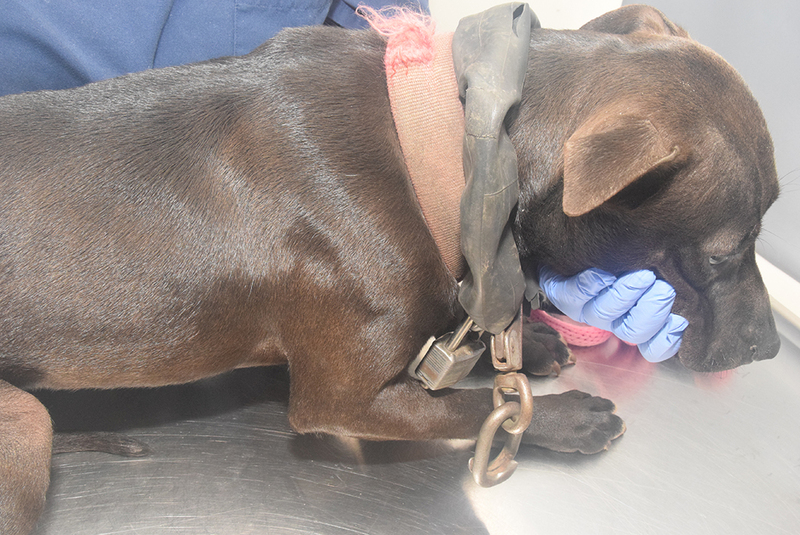 This case was significant, as it was the first federal dogfighting case in U.S. history to go to trial. 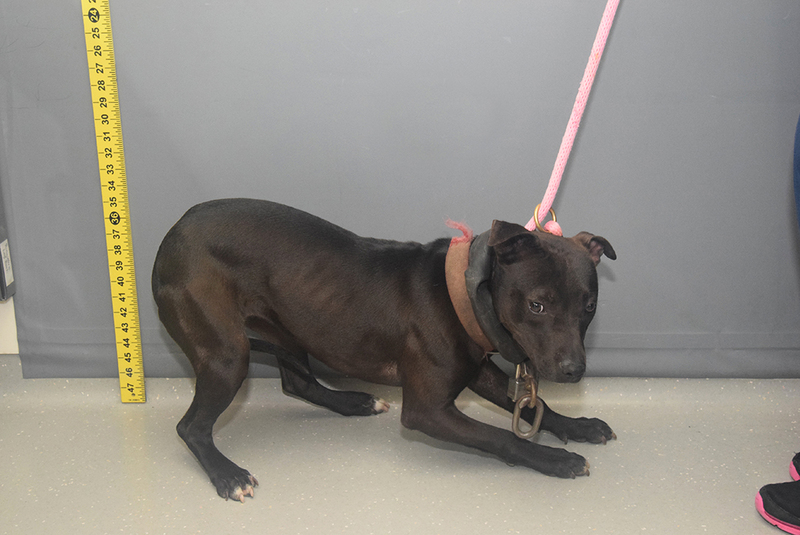 Ginny’s abuser was found guilty on all counts, and justice was effectively served for her and the 10 other dogs she suffered alongside. For people like Katherine Good, Ginny’s case is just another example of why we need to keep fighting. 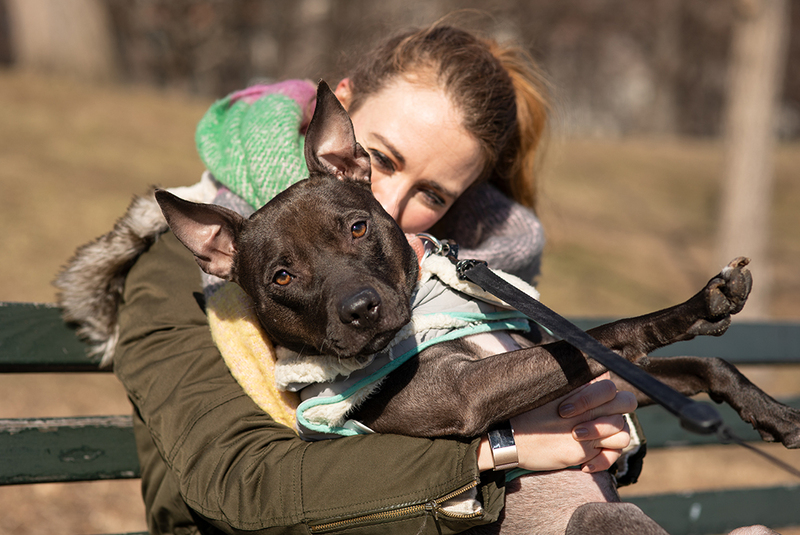 April 8th marked National Dogfighting Awareness Day, and while we will continue to fight for those who need us most, we hope that you can help give more dogs like Ginny a #fightingchance by signing our HEART Act Petition.